Let’s have a look ahead to what’s happening in Emmerdale this week shall we? Can you believe it’s a year since the helicopter crash that meant we said goodbye to Ruby and Val? This week, Cain and Moira’s relationship is on the rocks, Victoria is on to Holly, Nicola and Dan share a kiss and Gabby continues to be troublesome. When Cain finds the Pep treatment in Moira’s bag he accuses Holly of having HIV leaving Moira to confess they are hers. Cain and Adam are furious when Holly explains she’s back on drugs and that it’s her fault Victoria got hurt. Cain gives Moira an ultimatum and when she refuses to throw Holly out, he leaves instead and heads to the pub where he’s met by a dolled up Charity and the pair share a kiss. Later, Chas warns Charity that Cain won’t fight for her and she shouldn’t try to break him and Moira up, but will Charity be able to keep her mouth shut? Chas tells Cain to go back to an apologetic Moira and he returns with his own dirty little secret. Charity can’t resist taunting Moira and James can’t believe it when she hints she spent the night with Cain. As Cain is eating humble pie and on the point of winning Moira round, James interjects telling her that he stayed the night with Charity. Cain launches himself at James in a rage and when he realises that James knew about the HIV scare too he’s furious. Charity can tell he’s in a dangerous mood and follows him out of the pub to stop him doing something stupid but he drives at her. When Cain spots James driving out of the farm, he follows, preparing to ram him but when he sees Moira is in the car he breaks and skids wildly, smashing into a wall. Moira calls him crazy and tells him to stay away, saying their marriage was a mistake. As he miserably moves out of the farm, Charity is excited and wants him to stay at The Woolpack but he decides to stay at Lisa’s instead. Nicola is feeling amorous but Jimmy is treating her with kid gloves. When Dan is doing physio with her there’s definitely a spark when he catches her as she’s about to fall. She’s later given good news that she should be able to get around without a wheelchair, but there’s bad news that she might never get the use of her right arm again. She struggles to tell Jimmy the bad news and he is heartbroken. As Dan comforts her, she’s emotional and moves in for a kiss much to Dan’s shock. He later tells her that he can’t be her physio any more and pulls away from both Nicola and Jimmy. Can Nicola persuade him it was a one-off and to come back and help her? Why is Dan so scared to keep doing her physio, could it be that he is attracted to her? Sandy is hurt when he learns it was Gabby who stole his pension, whilst Ashley hopes he’s doing the right thing by involving the police. Gabby won’t go down without a fight though and seeing herself in the mirror gives her an idea that leads Ashley to be taken to the police station for questioning. Doug is worried about Gabby and calls on Liv for a favour to get Ashley and Gabby talking to each other again, but neither will back down. Harsh words are exchanged when Gabby tells Ashley she wishes he were dead and he retaliates that he wishes she’d never been born. Is there anyway back from this for the father and daughter pair? 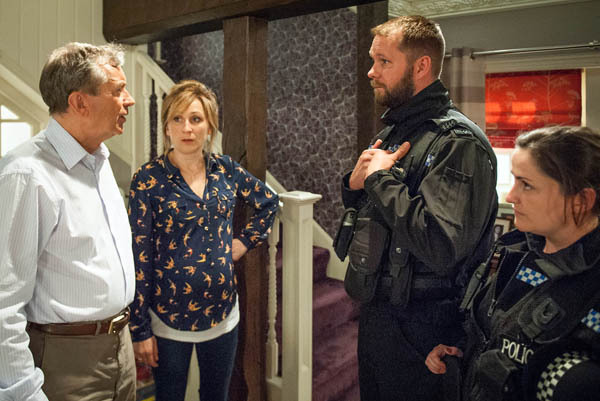 Holly is apprehended by Simon who warns her to get Moira to back off or things could get nasty. As if that wasn’t bad enough, she realises Victoria has seen the whole thing; and she’s put the pieces together. Victoria is furious and it’s down to Moira to beg her to keep quiet and not call the police. Later, Adam is pleased to see Victoria back in the van but is confused why she no longer wants to work with Holly. Charity suspects one of the customers in the Woolpack is in fact a judge for the competition she’s entered and pays Rodney to help her appear more caring. As the anniversary of the helicopter crash arrives, Finn and Emma decide to book a choir to commemorate the occaision and are left unimpressed when they cancel. Finn manages to improvise with a moving speech and his brothers show up singing as a replacement choir. Joanie asks Belle to be a bridesmaid but Belle has no idea what to say and walks off, leaving Joanie hurt. Ellie insists that Belle should tell Joanie to shove it, however Lisa and Dr Bailey tell her maybe it’s time to forgive and forget. Who will win the battle of Belle’s conscience and how far will Belle go to prove a point?